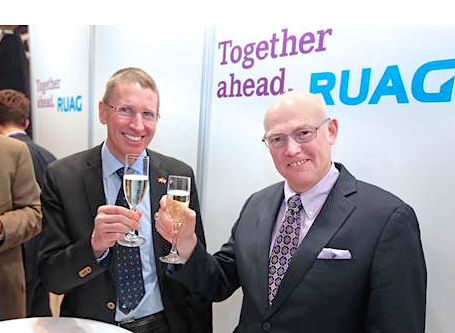 RUAG Space, supplier to the space industry, held a celebratory reception during the 33rd Space Symposium to toast the continued growth of the US footprint. Cheers! As RUAG's CEO Peter Guggenbach and ULA's President and CEO Tory Bruno celebrate RUAG's continued growth of its US footprint. The company now resides in four US states. stakeholders within both the European and US space community, RUAG officials thanked guests and showed appreciation for the US workforce, and industry partners. Joined by stakeholders within both the European and US space community, RUAG officials thanked guests and showed appreciation for the US workforce, and industry partners. The sites are strategically aligned with customers, partners, and relevant research and technology hubs. RUAG’s growing US team stretches over the US headquarters and large composites manufacturing facility in Huntsville and Decatur, Alabama; to the newest engineering facility located in Silicon Valley; the Denver engineering office; and the Florida production facility for satellite structures.